Looking for a hike to get you excited for winter? I suggest 5 Lakes, at the edge of Granite Chief Wilderness with beautiful views of Alpine Meadows and the back side of Squaw Valley. This hike begins along the southern flanks of KT-22, one of Squaw Valley’s peaks and ascends 980 vertical feet in 2.5 miles of steady climbing through expanses of exposed granite and jagged volcanic rock. 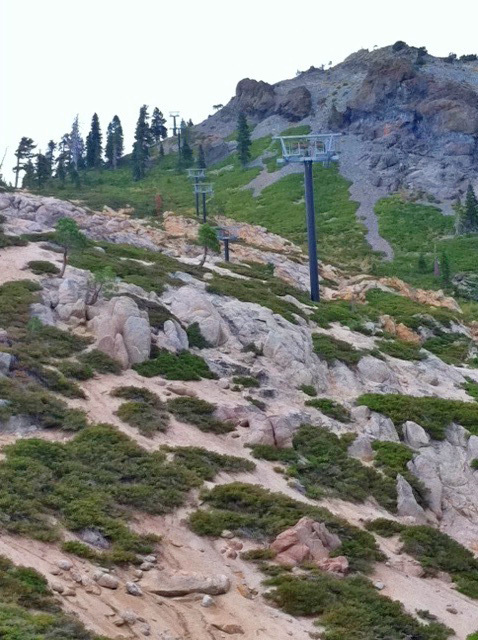 The first part of the hike is comprised of switchbacks with views of Alpine Meadows Ski Area on your left. This is the most difficult section of the trek, surrounded by thickets of Manzanita, mule ear, snowberry and a small forest of Jeffrey Pines offering only brief shade as you climb. Next you come to a narrow traverse on the side of an open sandstone and granite canyon where panoramic views of a jagged ridge line splays before you. Ascend up to the 5 lakes through privately owned acreage called “White Wolf” while passing under lift towers installed by owner Troy Caldwell in hopes of a future link connecting Alpine and Squaw some day. Once you have reached the 5 Lakes plateau and Granite Chief Wilderness, the rewarding sights end with a series of 5 beautiful lakes. The largest lake, also considered to be the prettiest, is the last one you come to and is the easiest the find. You can clearly see Squaw Mountain’s chair lifts rising up behind the alpine waters where you can relax and spend some time swimming or fishing before heading down. To get to the trailhead, take Interstate 80 to Highway 89 south to Tahoe City. After 9.5 miles, turn right on Alpine Meadows Road. Drive 2.1 miles to the trailhead on the right, across Deer Park Drive.